All directions on this page are copyright to Sarah Altmann Johnson. Please do not use these directions, or close variations thereof, to make ponchos for profit, without permission from Sarah (and Kristi at Gypsy Mama). Sarah can be reached by email at sjaltmann@hotmail.com. I started with the Gypsy Mama pattern (opens in new window), but knew I wanted separate head openings and a turtleneck for myself and a collar for Owen. I used the Alpine Fleece from JoAnn's and 1/4" seam allowances throughout. Questions? See this thread on the BabyWearer. For placement of the child head opening, I put O. in a pouch and measured from the appoximate neckline to where I thought I'd want to child neckline to start. I made his head opening a little big, since he doesn't really like clo thes going over his head, plus he still will grow a lot before I stop wearing him. For his collar, I cut out an elongated football/almond shaped piece of fabric, folded it in half, overlapping at the front, and sewed it around the neck opening. Oh, and when you cut the child's opening, make sure you cut it on the longer side. You'd think that'd be obvious, but I wasn't paying attention and didn't, so my poncho is several inches shorter than I'd planned. I also rounded the corners (I meant to have it more of an oval, but since I screwed up, it's more of a circle) and trimmed the selvages off the edges. I don't think I'm going to bother to hem it, but if I make another one -- maybe with Maden Mills? -- I probably will. This one was more of a test run. The revised version has a mama head opening that's an oval approximately 7 1/4" x 4 3/8". 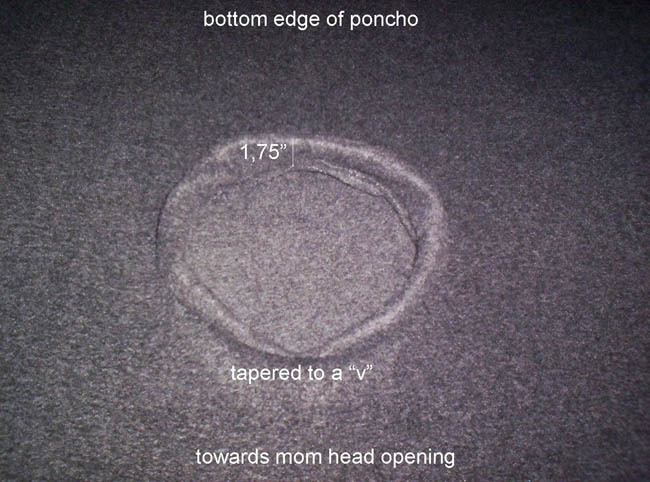 I place the top of the baby head opening (roughly a 5" diameter circle) 5" below the low point of the mama's neckline. Make sure you cut the baby's head opening from the longer side of the poncho! 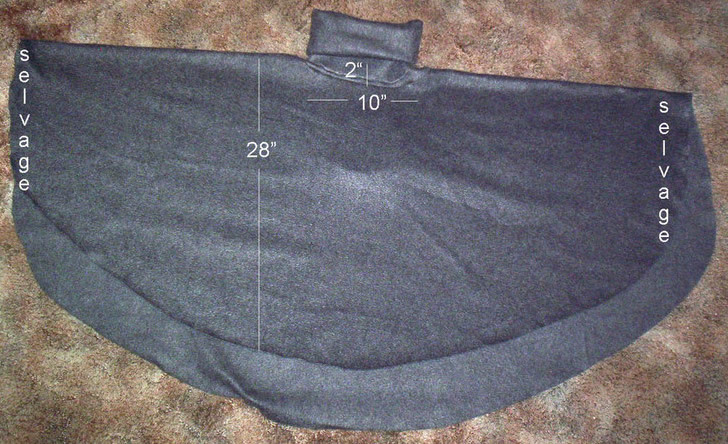 For the mama turtleneck, cut two 10.25" x 8.25" pieces (making sure the greater stretch is along the width). 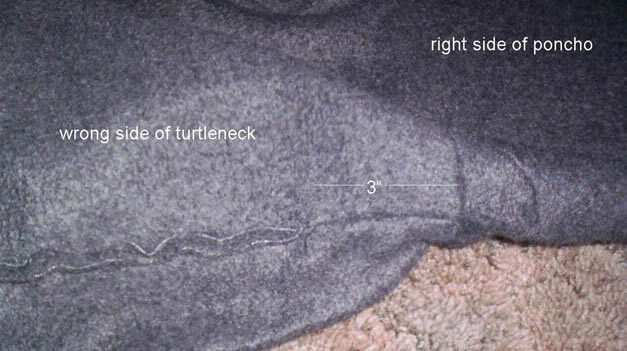 Sew the side seams with the bottom 3" wrong sides together and the rest right sides together. Hem the top. 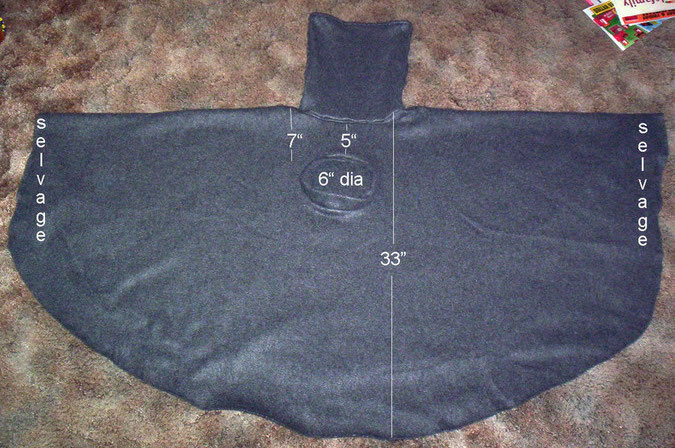 Mark quarter points on both the opening and the collar, pin and sew with a narrow zigzag. Fold collar and tack down at the sides if desired. For the baby collar (for optional adjustable collar, follow italicized instructions), cut one piece that's 17" x 3.75" (with the greater stretch along the width again). Sew short sides together with a 1/2" seam allowance, leaving a 5/8" opening 1" down. Finger press seam allowance open, then top stitch around the opening. Trim seam allowance. Fold collar in half wrong sides together, mark quarter points on both the opening and the collar, pin and sew with a narrow zigzag. Cut a piece of elastic cording about 22" long, thread through opening and add toggle to adjust. 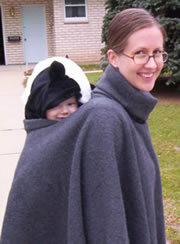 Maureen took the easy way out for babywearing outerwear: I am usually a size medium. Last week I purchased an xL maternity winter coat (usually 90$ marked down to $9.97) from the Gap. I can put my son in the sling, put the coat over both of us leaving the top 3 or 4 buttons undone, and we are so cozy. I don't have to put shoes or a coat on him, so I just walk him to sleep for his nap and come inside. No trying to undress a sleeping baby! This might not be an option if a mom wears a size 14 or up, but for slighty smaller mamas, it is easy to find a winter coat on super sale in a size 2 to 4 sizes too big, and in the spring, all stores have winter stuff 50-80% off. I have also done this with a really snuggly oversized sweater. Hilary S added this modification: I did a crew neck instead of a turtleneck, and made "sleeves" by doing the following: I folded the poncho as shown in the photos (with the mama collar at the center top), and sewed a straight line parallel to the top fold on each side about 10" long and 8" down from the top fold. I'm not a fan of having breezes blow up inside a poncho, so this gives it an extra barrier and helps it stay in the proper position too.